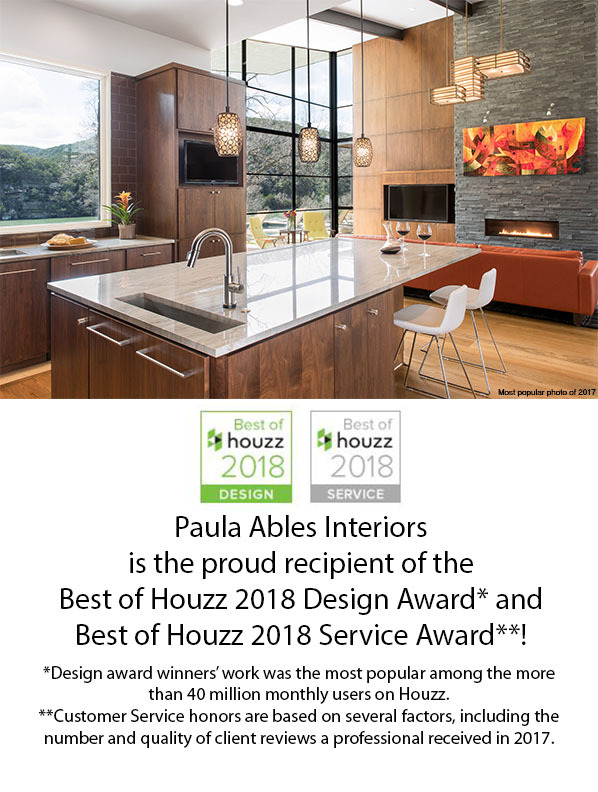 Austin, Texas, January 17, 2018 – Paula Ables Interiors of Austin, Texas has won “Best Of Design Award and Best of Service Award” on Houzz®, the leading platform for home remodeling and design. This unique and fun design firm who has been in business for 9 years was chosen by the more than 40 million monthly unique users that comprise the Houzz community from among more than one million active home building, remodeling and design industry professionals. “Paula Ables Interiors is delighted and honored to receive both of these awards for our commitment to excellence in 2018. We hope to have many more fun projects to share with you over the coming years” said Paula Ables, Owner and Principal Designer. Paula Ables Interiors is a different kind of Interior Design firm. Our award-winning designs are for projects of all sizes, from kitchen remodels to entire newly constructed homes. Paula is not only a Registered Interior Designer with the state of Texas, but she also has over 19 years of architectural experience. To compliment her Interior Design skills, Paula has created a number of original architectural designs and can produce construction drawings for any project, commercial or residential. Paula Ables Interiors can take your ideas, make them flourish, and turn them into reality.